The Trump administration declares war on public sector unions. Attorney General Jeff Sessions participates in a session at the Global Forum on Asset Recovery on Monday in Washington. On Wednesday night, the Trump administration declared war on public sector unions. In a brief filed with the Supreme Court, the Department of Justice reversed its position on the constitutionality of mandatory fees for public employees. The DOJ now believes that public sector unions may not charge these “fair share” fees, which support collective bargaining, to non-union members. It urged the court to strike down fair share fees as “compelled subsidization of speech” in violation of the First Amendment. Conservative politicians have long dreamed of imposing these “right-to-work” rules on the entire American public sector, and the Supreme Court’s conservative justices have prepared for this moment. In 2018, they’ll almost certainly answer the Trump administration’s prayers and permanently hobble U.S. unions. Abood held fast for several decades in the face of a well-funded movement to reverse the decision and enfeeble public sector unions. But in recent years, the Supreme Court’s right-leaning justices have indicated their eagerness to revisit and overturn the ruling. In 2012, Justice Samuel Alito wrote an opinion for the court criticizing Abood as an “anomaly” that “represents a remarkable boon for unions.” Then, in a 2014 majority opinion limiting Abood’s application, Alito lambasted the precedent as a “questionable” and “unsupported” aberration that “seriously erred” in its First Amendment analysis. The justice was obviously laying the groundwork to overturn Abood in the next union case. That case arrived quickly. In 2015, the court agreed to hear Friedrichs v. California Teachers Association, a challenge to Abood. At oral arguments in 2016, the conservative justices appeared ready to reverse the precedent. But Justice Antonin Scalia died just a month later, and the court split 4–4, allowing Abood to live another day. When an anonymous donor gave more than $17 million to keep Scalia’s seat in conservative hands, he or she likely had unions in mind. The Friedrichs stalemate proved that anti-union activists were tantalizingly close to reversing Abood. With just one more vote, the Supreme Court’s conservatives could abolish fair share fees in every state. And there is little doubt that Gorsuch, who takes an expansive view of “compelled speech,” will provide that fifth vote in Janus as his dark money benefactors intended. The Justice Department’s decision to abandon Abood as it lies on its deathbed was pretty much inevitable. 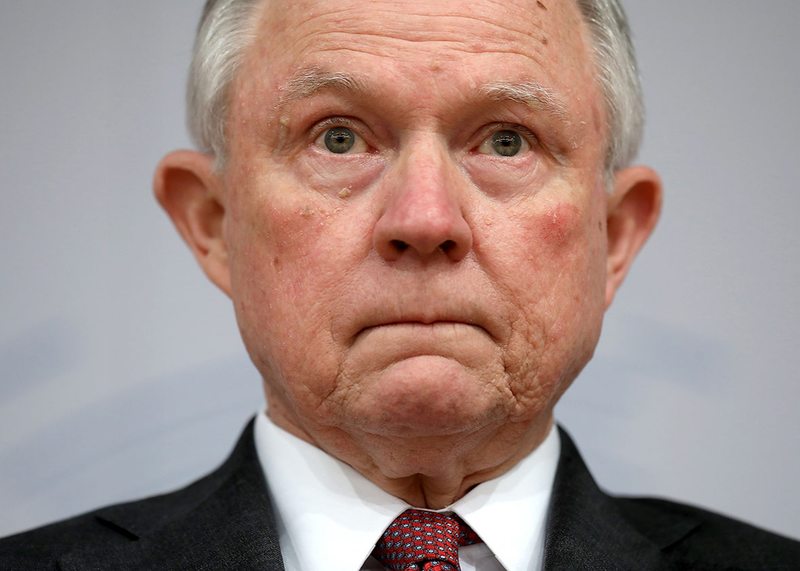 For years, the conservative legal establishment that now populates Attorney General Jeff Sessions’ DOJ has hoped to topple the pro-union precedent. With Janus, this movement has been handed a kill shot. But as the DOJ’s brief illustrates, these well-laid plans do not make the case against Abood any more persuasive. The First Amendment argument against fair share fees is essentially a partisan attack on unions dressed up in constitutional garb. Echoing Alito, the DOJ asserts that there is no actual distinction between collective bargaining and political activities, because bargaining is political. It claims that union-employer negotiations over pay and working conditions “inherently implicates concerns of politics and public policy.” Thus, anti-union workers have a First Amendment right not to fund them. And what of the free-rider problem—the phenomenon of non-union employees enjoying the benefits secured through bargaining funded by their union colleagues? In Abood, the court recognized that government, acting as an employer, has an important interest in preventing free riders through fair share fees. But according to the DOJ, these “dissenting employees” are not actually free riders at all. They are “compelled riders” forced to subsidize speech about “issues on which they may strongly disagree” in contravention of the First Amendment. This argument rests on two premises that are not only conceptually flawed, but also biased against unions themselves. First, the DOJ assumes that the First Amendment flatly prohibits the government from compelling Americans to subsidize speech with which they disagree. But this happens all the time: Tax revenue, for instance, is frequently used to promote messages that a taxpayer does not endorse, yet nobody seriously believes that taxes are unconstitutional. If the government imposed a special assessment on teachers and used the funds to promote education policies that some teachers disliked, they would have no First Amendment right to stop paying the tax—even though the state is forcing them to subsidize expression that they oppose. Why is the constitutional calculation different when the government directs a union to collect fees and negotiate policies? The unspoken assumption seems to be that unions are always partisan and untrustworthy. Second, the DOJ’s description of collective bargaining reflects a profoundly cynical view about the purpose of unions and the rights of workers. The DOJ insists that negotiations over basic terms of employment—health benefits, overtime pay, pensions—are “inherently political.” Really? Most teachers would probably not consider bargaining over the length of their lunch break to be “speech on politics.” But that is how the DOJ views every concession granted to public workers. Under this framework, anti-union employees do not reap the rewards secured by their dues-paying colleagues; rather, they are forced to accept benefits (like better pay) that they reject on political grounds. As the DOJ now conceives of them, public sector unions are essentially gravy trains that bilk money from the government, and free riders are noble “dissenting employees” who want less generous working conditions. This vision of unions, of course, is fairly common, especially among Republicans. That is why 25 states, most of them right-leaning, have passed “right to work” laws that eliminate fair share fees. But 22 states and the District of Columbia have retained these fees, and public employees in those jurisdictions tend to have higher wages due to their increased bargaining power. There is no plausible constitutional argument, and certainly no credible originalist argument, against the constitutionality of fair share fees. And yet, in Janus, the Supreme Court will probably invalidate them, instantly undermining thousands of union contracts for millions of workers across the country. The Trump administration will deserve much credit for this union-busting coup. It was Trump, after all, who installed the justice who will soon enable this nakedly political ruling. And it is Trump’s DOJ that is helping the court pretend that there is a valid nonpartisan argument against fair share fees. American unions have withstood a relentless assault since their inception, and the anti-union onslaught of the last few decades contributed to the decline of the working class. Trump promised to fight for these “forgotten” workers. But he and his man on the bench now stand poised to deliver them a devastating blow.